Happy Friday everyone! It’s our final day of giveaways here on Junebug and we sure have enjoyed spreading the holiday cheer and reading all of your thoughtful and creative comments this week! Today we want to offer you support, encouragement and helpful tools for your wedding planning process! Planning a wedding is no small feat, so we have two giveaways going on today to help you plan your wedding, your way. – A copy of our new book, Planning Your Wedding: A Step-by-Step Guide to Creating Your Perfect Day! – A copy of our book! – A beautiful Custom Marriage Certificate from Wiley Valentine! – A Be Wed Planner from Evotive! – A Name change gift card from Miss Now Mrs.! – And a free wedding website from Nearlyweds.com! To enter to win, leave us a comment telling us about your most valuable wedding planning resource. Blogs, magazines, websites, books, professional references, family, friends? Where have you been finding your most useful wedding planning information? We will accept entries through Sunday night and we’ll announce all the winners from the week on Monday, December 21st. Good luck! Planning Your Wedding: A Step-by-Step Guide to Creating Your Perfect Day is the book that Blair, Kim and I wrote as part of the new Knack how-to book series. We worked hard to make it as helpful, encouraging, and stylish as we possibly could, and we packed it full of gorgeous photos to give you all kinds of inspiration for your big day! Wiley Valentine’s wedding invitations are favorites of brides everywhere- their super creative designs are truly one of a kind! Another fun item they recently came up with? Custom marriage certificates to save as keepsakes! Genius! So much lovelier than the official paperwork, these certificates would look amazing as part of a wedding album or framed and hanging on the wall of your home. The Be Wed Planner from Evotive is a modern wedding planner and organizer that helps make your wedding planning process organized, strategic, and personal to you. No matter what your budget, and whether youre planning the wedding yourself, or working with a consultant, this creative system has everything you need to keep you on track and feeling like you’ve got it all under control in one handy place! If you’re changing your last name after your wedding, spare yourself a big, big headache, and don’t try to navigate all that paperwork alone! The Miss Now Mrs. Name Change Service supplys you with all the forms you’ll need for your state, an auto-fill feature so you only have to enter in your information once, specific instructions for proper filing, and fantastic personal customer service to help you through it all. Nice! 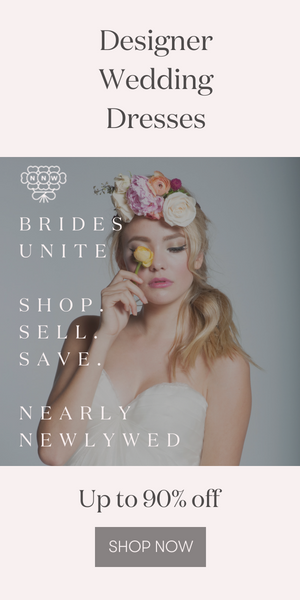 Nearlyweds wedding websites offers up creative wedding website templates (with matching invitations- how smart!) that are full of useful features and gorgeous designs. You can write a blog, track on-line RSVPs, upload unlimited photos to galleries, use push-pin maps to show where your guests are traveling from, upload music, share all of your wedding information and let your guests comment and share photos and stories of their own. All this with an easy to use drag-and-drop editor and layouts created by popular wedding invitation designers. What more could a girl ask for from a wedding website? We love it! At first I though it would be different planning books. I was so excited to shop and buy different ones, but then I started to realize I can only read them once and then it just sits there until I need it. After a month or two of being engaged, I found wedding blogs. I love waking up and checking my dailies to learn new tricks, gather new ideas, view amazing wedding photography….I always find new, fun things everyday and I just LOVE it!! Blogging has inspired me to create my own for myself to keep track of different sites, vendors, DIY tricks, etc. Plus I just think its something cool bc at the end I can print out my blog and have it as a keepsake!! I have been using Twitter -to follow wedding blogs, and find websites with wedding info.I’m constantly “googling” for wedding information! Wedding Blogs!!! This one, Martha Stewart Weddings, Style Me Pretty, etc. etc. etc. I am obsessed! The Knot has always been what I come back to the most in terms of reviews, ideas and community.. I love looking at photographers websites. By looking at past weddings you can see things you like, dislike, things you want to use. It can be hard bc you dont always know all the details, but its still fun!! Google Doc’s for guest lists! My friends and family have been a huge help, but one resource that I was totally unaware of before I got engaged was wedding blogs. Now I am addicted! I love checking them every week (sometimes day!) to see what’s new, get creative ideas, look at great photos, and find vendors. My most valuable wedding research tool has definitely been wedding blogs and/or internet. I am an internet junk- I mean, I love the internet and once I discovered wedding blogs I was hooked. Everyday it seems I stumble upon a new blog to help me in my quest for the “perfect” wedding. I’m planning a wedding in my hometown from 800 miles away. It can be challenging but being organized is key. I have to say that by far my most valuable resource has been my other wedding vendors. Particularly my DOC and photographer. They’ve been helpful with letting me know who they like to work with and also have given great honest feedback (positive and negative.) I communicate with both of them regularly through twitter and facebook. I feel like I’ve gained two friends in planning my wedding that I wouldn’t have met otherwise. My best source for wedding planning? I used to be a wedding planner! I know it’s not really fair, but boy has it made my wedding easy! Wedding blogs have been my sanity in planning. It is my place to go for guidance and inspiration. Thank GOD for the internet.I don’t know where I would be with my wedding planning without the net.I heart wedding websites like The Knot and Project Wedding…Project Wedding to me is like a bridal Facebook.I am also sooo addicted to wedding blogs.I also love browsing the work of Wedding Photographers for great ideas.I most frequent What Junebug Loves…The WeddingChicks….The Brides Cafe and Style me Pretty. Most valuable tool? I always have my “bridal bargains” book in my purse. It has tons of tips on how to save money. Most inspirational tool? blogs of course! I am absolutly addicted to blogs! I didn’t renew my magazine subscription b/c blogs is where I have gotten all of my inspiration. I setup my google reader to have around 15 blogs feed into it and check it daily! Wedding blogs like What Junebug Loves have definitely been the most helpful planning/inspiration resource! I love that they are updated almost daily, eco-friendly, and always feature the most beautiful weddings and creative DIY projects! I don’t know how anyone planned a wedding in the time before wedding blogs! I also don’t know what I’m going to do once I’m done planning the wedding… I can still read wedding blogs every day, right?! Microsoft Excel. nerdy, but oh so CRUCIAL!! Aside from the obvious (I check What Junebug Loves religiously! ), my best resources have been my recently married friends. I love hearing about their experiences planning as well as on the big day; it has given me an invaluable idea of what to expect now and in the future, and how best to handle whatever comes my way! Blogs for sure! They give me such great ideas and inspiration and point me to vendors I did not know about! Definately my most valuable wedding planning resources would be blogs and magazines. I am getting so much inspiration from both sources! From pictures to inspire me to step by step how-tos ; all I could ever need is online and in magazines! The internet and Blogs are a Godsend! I have found so many unique and trendy ideas for a do it yourself kinda bride like myself on a teeny tiny budget this works best! Since I work full time and go to school it helps to be able to plan my wedding esentially on the internet. I definitely use books, my coordinator, and of course, blogs! The books are a good guide through the process, step by step, my coordinator is great for random questions and useful “I’ve been there, done that, seen that” information, and blogs…how I love them! They are SO inspiring!! I have utilized the internet in so many ways! I have been scouring through pictures for inspiration, blogs and websites for do-it-yourself ideas and forums for advice. I love to look through magazines for ideas and friends who have already planned their weddings are great resources! I am using google reader to make sure I get the latest and greatest news and inspirations from the wedding blogs. This is an amazing tool and so easy to use! MY MOM!!! !…oh and email and excel! My most valuable planning tool so far has actually been my photographer. I’m doing my best to incorporate the most local goodness that I can, and these guys know their stuff! It was imperative to me that I find a photographer that appreciates and articulates the personality that geographic locations have, too, so it’s been wonderful. Oh, and myself, of course. It’s easy to get bogged down in these BEAUTIFUL inspirational weddings, but at the end of the day it’s going to be OUR wedding. That’s what matters. I found a board, disneybrides.com, which has been FULL of helpful comments. Although geared toward the bride who is hosting a wedding at WDW or DL, they have a lot of ideas that can be incorporated into a Disney inspired wedding at home. They are also really supportive and not shy about stating opinions! Blogs! Blogs! Blogs!! The have provided so many resources and inspiration. I have been routinely checking oncewed.com (love, love, love!) for inspiration and following local blogs for various recommendations, ideas, etc. Northwest blogs! We just do things a bit differently then the rest of the country and I love it. Blogs on Junebug, Martha, and my personal wedding guru, stevenmooredesigns.com (so talented.) My photog and planner have been clutch on finding vendors that embody my personal style. I was never one of those people who had “my dream wedding” in the recesses in my mind. I envied my girlfriends who had a gorgeous picture in their minds of what their day would be like – their dress, their ring – but I just couldn’t bring myself to imagine it. Somewhere down deep I knew that when “he” came along we would discover our wedding together – there was this part of me that didn’t want to plan something so special without the person that would make the whole day real. And then it happened! He would be mine, and I would be his, and WE would be planning this beautiful celebration – together. In short, my fiance and both of our families is where I have gained the most inspiration for our day. In fairness, I have become completely obsessed with blogs and magazines, and anything else that provides me with eye-candy inspiration for our big day (!). But honestly, put into perspective, it is my man, our relationship and our family history that has defined our wedding vision, and has been our greatest “planning tool”. well, the blogs provide endless inspiration for diy-projects, unconventional ideas, photography styles, etc. that is my number one resource. but for etiquette and other what-to-do’s since planning a wedding is a first for me, mindy weiss’ “the wedding book” has been invaluable. I think my best wedding planning resource is the internet in general. I’ve been able to do so much research that just wouldn’t have been possible 10 years ago! Undoubtedly the best wedding planning tool that I have is the network of blogging brides and businesses that so willingly share their ideas, creativity, and enthusiasm! I follow several wedding blogs each day to get ideas and inspiration. Each blog has something unique and endless amount of ideas for any bride! Blogs, hands down. What I love most is the wide range of weddings that are showcased in blogs. I think it’s really good for keeping perspective, and for realizing that our wedding can be so many things. There’s not just one way to do this! I have had two cousins get married in the last few years and they are such great help, just a phone call away! I love reading wedding blogs or I should say I love looking at the pictures, a picture is worth 1,000 words. I love planners to death. The Be Wed planner from Evotive is divine. No joke, I have so many planners already. Though somehow I haven’t changed my name at my bank yet and I got married a year ago. Oops! Wedding blogs have been the best planning resource – especially this one! I have to echo Wedding Blogs! My favourite ones are so good at presenting & sharing ideas and photos etc! Like this one!!! Also, I *heart* Google; when it came to designing the invitations and adding image elements I used Google to find cetain images to add the perfect, personal touch. Thanks for this fun showcase week!!! The minute I got engaged I immediately purchased the first wedding magazines I could get my hands on. Well actually for the first 4 months, I soon realized that being that my needs are a little different, being that I am having a traditional East Indian Wedding the magazines don’t help very much (though I have taken a guest book idea from Martha Stewart Weddings). So I’ve relied on blogs, friends and family, websites and magazines and random ideas inspired on the fly. One of my floral arrangements is inspired by something I saw at Home Depot. Since we’re having 4-5 days of events and mixing East and West, so really my inspiration has been drawn from everything that surrounds our lives. Hopefully I can put it all together and make it a beautiful and memorable day! Aside from my very very wise already married friends, I’ve been using blogs as my main source of inspiration. I subscribe to the major players, but for finding specific things like venues I type in the keywords into google “Seattle barn wedding” and then go to images to find the pictures on specific blogs. It’s most helpful when photographers list the vendors so I can see ideas played out and in context!!! Keywording and tagging is a God send. Seriously! I have an entire folder on my computer filled with pictures of inspiration. Where do I find them? On the most inspiring wedding blogs,of course!! My top three would have to be Green Wedding Shoes, Junebug weddings, Oncewed, and (yes and…I couldn’t keep this one out) With this Ring. I also would be lost without my handy dandy microsoft office onenote to collect my piles of ideas. my greatest wedding planning resource is my friends! they keep me on track, help me find wonderful vendors and websites, and support me all the time! I just recently got engaged and I thought I would need tons of traditional magazines to get inspiration…How terribly wrong I was. Blogs like Junebug have so much to offer…I am going to keep reading even after the wedding is over! So impressive! A perfect preparation for a wonderful wedding !